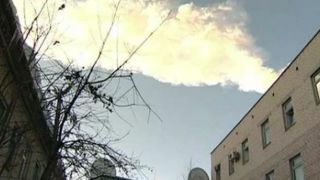 The meteor exploded just above the city of Chelyabinsk just before 9:30 a.m. local time, damaging hundreds of buildings and injuring more than 1,000 people. The blast probably released about 300 kilotons of energy, sending out a powerful shockwave and lighting up the daytime sky, researchers said. "This event must have been brighter than the sun, if you were there to watch it," Paul Chodas, a scientist with the Near Earth Object Program Office at NASA's Jet Propulsion Laboratory in Pasadena, Calif., told reporters today. "It's just incredible." This space rock exploded 12 to 15 miles (19 to 24 kilometers) above Earth's surface, releasing roughly 15 times as much energy as the atomic bomb the United States dropped on the Japanese city of Hiroshima during World War II. The resulting blast shattered windows and knocked down walls, according to media reports. "When you hear about injuries, those are undoubtedly due to the shockwave," Cooke said. The fireball hit Earth's atmosphere at about 40,000 mph (64,374 kph) and left a trail 300 miles (483 kilometers) long in the sky, he added. Although the explosion did shoot fragments of the rock toward the ground, there have been no confirmed reports of recovered pieces of the space rock, Cooke said. Scientists have a particularly difficult time tracking small asteroids like the one that exploded earlier today because they are so small and dim. The Russian meteor was particularly difficult to spot because it came from the daylight side of the planet. Telescopes can only detect meteors in the dark, Cooke said. Space rocks like the Russian fireball hit the Earth once every 50 to 100 years, he added. Most asteroids are loose masses of rock, and NASA experts think this meteor probably fit that description. As the fireball entered the atmosphere, it started to break apart and eventually exploded when the heat generated by its dramatic plunge toward the Earth's surface became too great. This is the most powerful meteor explosion of its kind since the Tunguska Event 1908, researchers said. The meteor that exploded that year over the Tunguska region of Russia's Siberia was probably 130 feet (40 m) in diameter and flattened 825 square miles (2,137 square km) of forest. A meteor similar to today's fireball exploded in the air over Indonesia in 2009, but it didn't cause nearly this amount of damage. This most recent meteor explosion was probably four to five times more powerful than the 2009 event, Cooke said. By coincidence, the Russian fireball exploded on the same day that the 150-foot-wide (45 m) asteroid 2012 DA14 cruised within 17,200 miles (27,000 km) of Earth. 2012 DA14's flyby was the closest by such a large asteroid that scientists have ever known about in advance. The two space rocks that made big news today are completely separate bodies, Cooke and Chodas stressed.